15 Aug 2018 --- Wouter Stomph, from Olam Cocoa, spoke with FoodIngredientsFirst about its latest cocoa concepts and formulation solutions for plant-based alternatives within chocolate milk. The demand for plant-based proteins is being pushed up as more people look for a high protein diet and move away from animal-based proteins. The challenge comes with flavors and the technical aspects of the proteins. At IFT, Olam presented a pea-protein based chocolate beverage with pumpkin seed protein as well. 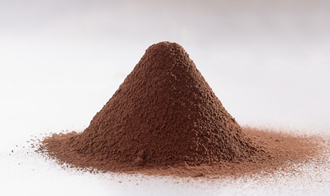 Innovators used a dark red cocoa powder that Stomph describes as “really vibrant” and able to round off very well some of the bitter and off flavors linked to the pea protein. 21 Feb 2018 --- Olam Cocoa was showcasing its new dark cocoa powder without added sodium during ISM/ProSweets 2018. The experts in cocoa wanted to give clients an excellent tasting, dark-colored cocoa powder but with less sodium. Following a period of research and development, Olam Cocoa pioneers came up with the premium cocoa powder deZaan D11BK, which according to the company is the first ever nib alkalized, black cocoa powder that provides both intense cocoa flavor and very dark color, without added sodium. Speaking FoodIngredientsFirst during the show, Rinus Heemskerk, Global Head of Product Development & Innovation explained the key points about deZaan D11BK as well as leading trends within the cocoa category.